Since 1994, Barbara Pollack has written on contemporary art for such publications as The New York Times, the Village Voice, Art in America, Vanity Fair and of course, Artnews, among many others. She is the author of the book, The Wild, Wild East: An American Art Critic's Adventures in China and has written dozens of catalogue essays for a wide range of international artists. In addition to writing, Pollack is an independent curator who organized the exhibition, We Chat: A Dialogue in Contemporary Chinese Art, currently at Asia Society Texas and she is a professor at the School of Visual Arts in New York. She has been awarded two grants from the Asian Cultural Council as well as receiving the prestigious Creative Capital/Andy Warhol Foundation Arts Writer Grant. Drawing parallels between the female body and fragile ecosystems, American artist Patty Chang’s The Wandering Lake is an extended meditation on loss and mourning cast in the guise of a travelogue. Encompassing video, installation, sculpture and an artist’s book, the exhibition took over several rooms of the Queens Museum, taking viewers on a journey that covered personal memories as well as diverse geography. Chang is best known for her video work from the 1990s in which she used her own body to explore depictions of Asian identity, testing the limits of social acceptability. More recently, she has moved behind the camera, turning into an explorer of exotic locales. In The Wandering Lake, she combines both tactics, achieving a powerful and resonant statement on the impact of manmade disasters and the effect of her own aging process. Her title comes from The Wandering Lake: Into the Heart of Asia (1938), a book by colonialist explorer Sven Hedlin about Lake Lop-nor located in Xinjiang Province in Western China. In 2009, Chang attempted to travel to the lake but was prevented by recent riots and the lack of transportation to the remote site. Instead, she uses two other locations as a metaphor for Lake Lop-nor. 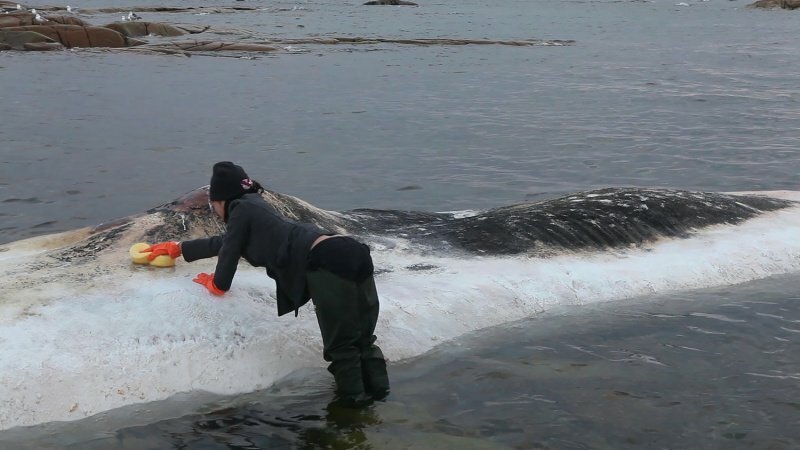 In the video installation, Invocation for a Wandering Lake, Part I (2015), she is seen tenderly bathing the corpse of a beached whale off the coast of Fogo Island in Newfoundland, Canada, a historic fishing village where cod fishing, its life source, is now forbidden. 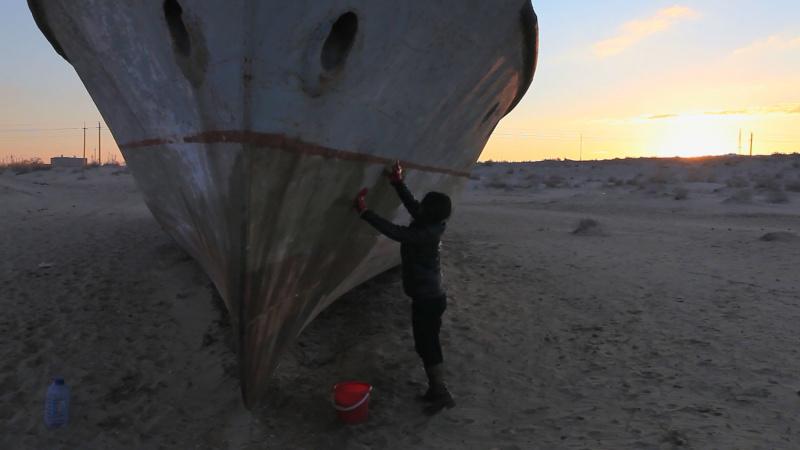 In Invocation for a Wandering Lake, Part II (2016), Chang washes the hull of a stationary boat, isolated in the middle of a desert, the result of a massive irrigation project that stole water away from the Aral Sea in Uzbekistan. These two works were shown adjacent to each other, projected on freestanding planks of cardboard, positioned across the gallery’s floor. Mesmerizing and mournful, these videos brought to mind the recent calamities caused by global warming and the futility of individual action on this issue. Throughout this exhibition, Chang casts herself as a global explorer, but in contrast to adventurers of the past–male, European, colonialist–she is humbled and saddened by her discoveries. We are drawn into her journey by her method of always connecting her documentation of these sites to a visceral personal experience. Resisting the tendency to romanticize these locales, she incorporates explicit body functions that may be off-putting or even nauseating. But by doing so, she is able to convey her horror at the destruction she is sighting all over the planet, a finding that she hopes we too will find heartbreaking. Since 1994, Barbara Pollack has written on contemporary art for such publications as The New York Times, the Village Voice, Art in America, Vanity Fair and of course, Artnews, among many others. She is the author of the book, The Wild, Wild East: An American Art Critic’s Adventures in China and has written dozens of catalogue essays for a wide range of international artists. In addition to writing, Pollack is an independent curator who organized the exhibition, We Chat: A Dialogue in Contemporary Chinese Art, currently at Asia Society Texas and she is a professor at the School of Visual Arts in New York. She has been awarded two grants from the Asian Cultural Council as well as receiving the prestigious Creative Capital/Andy Warhol Foundation Arts Writer Grant.